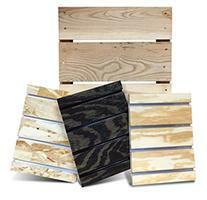 Construction Series includes various plywood, oriented strand board (OSB) panels, and kiln-dried hardwoods. The diversity of Construction Series creates a multitude of options through the use of finishes and core combinations. Construction Series complements retail environments looking for a natural expression or industrial like atmosphere. Panels can be painted or stained to achieve the desired finished expression. Inserts are optional, providing greater strength capacities. 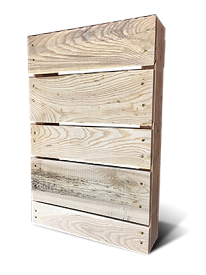 PALLETwall™ brings a rustic charm to retail display environments while providing strength and durability necessary when merchandising. 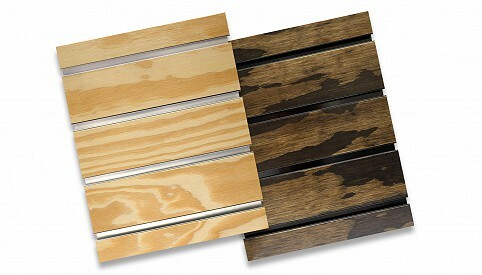 Using kiln-dried hardwood, PALLETwall™ is custom manufactured to exact specifications. The rough, unique textures can be displayed naturally or stained to complement any retail environment. Installation of PALLETwall™ is simplified utilizing Wind Mill’s Wind-Cleat™ system. Using standard slatwall accessories makes display, organization, and storage easy. Wind Mill’s OSB slatwall is free from printed lines or labels often found on construction material. Its rugged appearance is perfect for, sporting goods, industrial-like, and outdoor looking retail environments. Optional aluminum inserts, in an assortment of colors, adds beauty as well as strength. OSB slatwall can be stained or painted and looks amazing with an optional clear finish. When stacking one to two panels, only one edge requires a half groove, the final size is 47½”W x 95½”H (grooves can be cut to run in the long or short direction). Panels stacked more than two high require middle panels to have half grooves on each horizontal edge making the panel 45”H x 95½”W. NOTE: The aluminum inserts sit slightly below the face of the panel. Plywood slatwall is rugged in appearance. As a member of the Construction Series it is perfect for, sporting goods, industrial-like, and outdoor looking retail environments. Optional aluminum inserts, in an assortment of colors, adds beauty as well as strength. Plywood slatwall can be stained or painted and looks amazing with an optional clear finish. Digital printing directly to PALLETwall™, Oriented Strand Board (OSB) and Plywood. Logo’s as well as photos and paintings can be directly printed to the wood surface increasing mechanizing options. Call our expert project managers for more details.